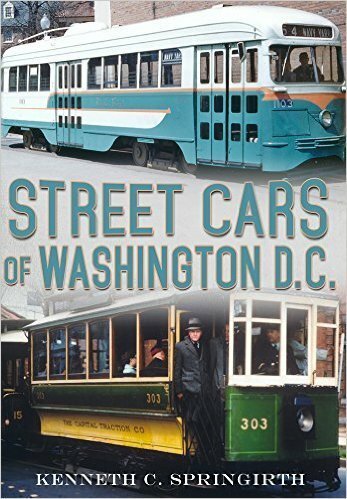 Street Cars of Washington, DC - Signed by the Author! 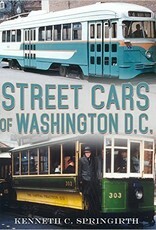 Home / Street Cars of Washington, DC - Signed by the Author! Street Cars of Washington D.C. is a photographic essay of the history of the well-kept modern street car system that provided frequent transit service to much of our nation's capital up to its closure in January, 1962. Washington D.C. was the first North American city to operate its entire base service by President's Conference Committee (PCC) cars. Washington D.C. had the fifth largest PCC car fleet in North America. While these cars had poles for overhead wire operation, they were the only PCC cars in the world equipped with plows for conduit operation. Washington D.C. PCC cars, all built by St. Louis Car Company, were about two foot shorter in length or one less window than other PCC cars, because of short clearances in car house transfer tables. The Silver Sightseer in Washington D.C. was the world's first air conditioned street car. Fifty four years later in February 2016, street cars returned to Washington D.C. All of this has been included in Street Cars of Washington D.C.